Vintage authentische 1945 Blockhaus inmitten ¾ Hektar Wald. Mit Blick auf den Lake Michigan mit 65 Holztreppen zum 80 'langen privaten Sandstrand. Vier-Zimmer-Haus zu Hause für acht Personen. Zwei Schlafzimmer im Erdgeschoss, zwei Schlafzimmer im Obergeschoss. Erdgeschoss Schlafzimmer bietet Kingsize-Bett mit eigenem Vollbad. Gästeschlafzimmer im Erdgeschoss bietet Doppelbett mit eigenem Vollbad. Im Obergeschoss Schlafzimmer mit zwei Einzelbetten, zweites Schlafzimmer bietet Doppelbett. Einzigartige 12 Fuß offene Geländerbrücke verbindet zwei Schlafzimmer im Obergeschoss. Brücke übersieht gesamten Lebensraum darunter. Großer offener Grundriss mit Kamin im Wohnzimmer. Bad mit Regendusche vom Wohnzimmer. Galley Küche, halbes Bad aus Küche mit Trinkbrunnen. Natürliche Kiefernholzböden überall. Gesamtes Haus ausgesetzt Kieferholz und Zeder Panel. Badezimmer mit Schiefer und Fliesenböden. Unvollendeter offener Keller mit zweitem Kamin. Waschmaschine und Trockner Waschküche im Keller. Genießen Sie große Liegewiese mit Sitzgruppen. Freudenfeuer, Marshmallows rösten, Lagerfeuerlieder singen. Überdachte Veranda mit Sitzgelegenheiten. Die Gäste können Sonnenschirm, Liegestühle, geschlossene Lagerhalle genießen. Zweite Feuerstelle am Strand, Kajaks, Paddelboot. Ski-Skate-Luge. Zu Fuß zu Red Rooster Tavern lokalen Familienrestaurant. Prime Sommer wöchentliche Vermietung nur. Nebensaison Vermietung 2 Nächte Mindestaufenthalt. Great place, will definitely be back! We had a wonderful vacation there, the cabin is well stocked. There are kayaks, boats, a slide, a swing, a fire pit and 2 fire places. The basement has lots of games too. The owner is very responsive, we had an issue where the owner had to come in and they showed up and resolved the problem in less than an hour. The views of the lake especially around sunset time are amazing. Authentic log cabin on picturesque Lake Michigan, they even left out the vintage Christmas decorations. A fantastic log cabin, with a wonderful view and everything you need for a home from home vacation. We stayed in this enchanting place for thanksgiving and we feel really thankful that we did. Our time here was just what we needed to relax and unwind. The walks along the shore helped mitigate the turkey dinner and roasting marshmallows for s’mores as the sun went down was amazing. Definitely a place we would like to visit again. We truly loved every minute of our two week stay in this beautiful home! It was just so comfy and cozy, my wife actually cried when it was time to leave! 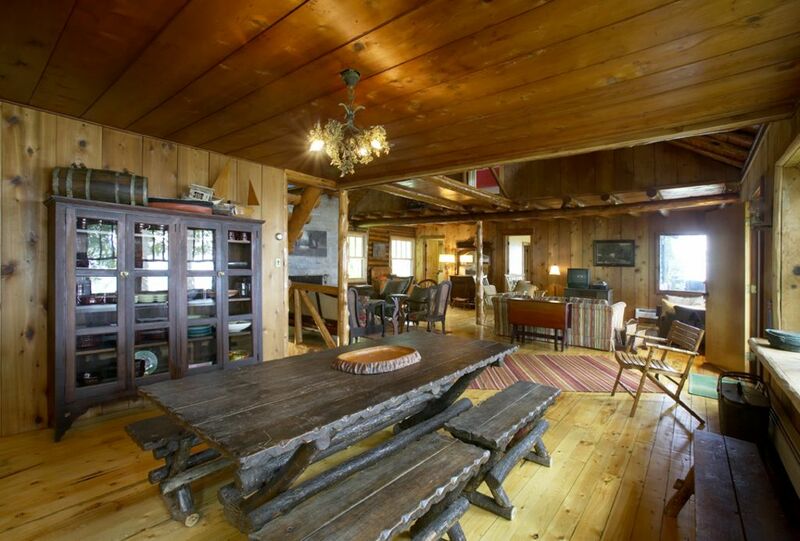 The VRBO pictures simply do not do it justice - It was even more beautiful and spacious. There wasn’t a corner of the house where there wasn’t something fun and interesting to look at. The basement was a a complete surprise and full of game tables, and on rainy evenings these two old geezers had a great time playing air hockey! The beach was spectacular and completely private. The sunsets were magnificent, and the full moon lit up the night sky. We saw many deer, and as our title suggests, it just felt like we were in an enchanted cottage. The Craigie's supplied everything we could have possibly needed for a comfortable stay. You couldn’t ask for more gracious and considerate hosts. We highly recommend this vacation getaway! Had a great ladies weekend in this charming log cabin home. Fully stocked with anything you should need. Hosts were pleasant and accommodating to our early check in. Great view, nice amenities and plenty of seating to relax and lounge. Some of us even went into the chilly late September water. So Wonderful! Perfect for a Lake Michigan get away! The log cabin was absolutely beautiful! It was well equipped, not just with essentials, but a game room downstairs, baskets of blankets to get cozy, wonderful bedding, decor that was vintage and gorgeous, and so much comfortable seating for family time or just reading a good book (both inside and out). The beach was wonderful! Note, there are quite a few steps to the beach, but well worth the effort. The owners were responsive (we couldn't find where to turn the hose on) and very kind. This log home is so authentic and just so heartwarming! The only real issue was the mosquitoes and biting flies (but hey, comes with the woodsy seclusion), so bring lots of bug spray. But I definitely recommend this gorgeous home and will stay here again next visit! Thank you! $150.00 cleaning fee applies per stay. Linens/towels used are to be left in each room, we will launder and prepare bedding for next guests arrival.